Its repetitive melody helps you find your rhythm when hiking trails or jumping ropes. It’s an ear worm that keeps you steady when the task at hand seems monumentally tedious. It diverts your attention from the monotony to the goal. That’s what I feel when I revise. When I finish a first draft, breathing a sigh of relief and accomplishment, I move on to the first revision. Only to discover another plot hole. A character acts out of character. First person slips into third person. Or worse, the history is wrong. I write a blend of historical fiction and American fantasy, blending the folklore that captures the American identity with a unique form of fantasy that – I hope – captures forgotten times and personalities in American history. My first book, Big River’s Daughter, begins in December 1811, when a series of earthquakes shook the Mississippi River basin. It shook so hard, the river ran backwards. It changed the landscape. Language is as important as the history during this time. In true rough and tumble fashion, the heroes of tall tales mocked and defied convention. Annie Christmas and Mike Fink – two important characters in the book – used language as wild and unabashed as the circumstance and landscape that created them and the protagonist, River. If the language isn’t correct, not only to the time and place and character, it’s time for a second revision. Even after a manuscript is done, it's not truly done. My dear agent and I have a process. After so many rejections, we review the story, and look for possible revisions. For all the blood, sweat and tears – no tall tale here! – spilled during the writing of the manuscript, a manuscript is more likely to get rejected than not. Over winter break, I revised one rejected manuscript, taking it from 150 pages to 175 pages, refining character, language and plot while expanding on the historical context. 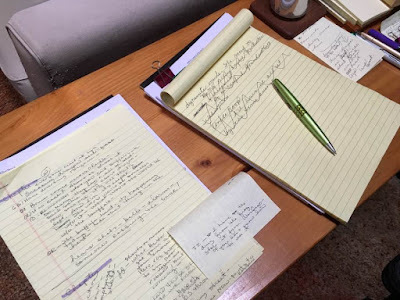 During these times, I have to keep reminding myself, revising is when the real writing begins. This is when the real story emerges, the one that needs to be told. I only hope the editor agrees. Now I’m revising another historical fantasy manuscript. The original was an experiment into the contemporary. After several rejections, it became apparent that the experiment didn’t work. With this book, I venture into the wild, wild west, taking on its fantastical landscapes and lore. You know what? I hate beer. And this morning, I hate revision even more. It’s hard, hard, hard work. And there’s no guarantee that after all that blood spilled, sweat poured, and tears cried, and there’s been plenty of each, I’ll even be offered that coveted contract. So why do it anyway? Wait. Pause. Take a breath. True enough, I have enough gardens, stretching almost a full acre around my cabin. And I have enough hobbies, which mostly centers on books and more books. And my cat would not let me live to see another day if I dared give him a bath. And I haven’t had a baking oven for close to a decade. Thank you for this post! Yes, sometimes I wonder why the garden and the cat and cello and the cooking isn't enough... I STILL return to this story I've been working on for so many years! It takes time. And it helps knowing it takes other writers time as well... yay for growth and experimentation and hanging in there! What is it that drives us to this madness? We work so hard, revising and revising and revising, never knowing if anyone will take it on. Good luck with the revisions. I hope you hear a "Yes"!! You're a good writer whose stories deserve to be read. I can definitely relate to the ardors of writing historical fiction, Bobbi. At least your references are all in English. Those for my historical YA set in Milan are in Italian, which I can barely read! Good luck! I'm in the midst of revision, too. Best of luck with yours! Best of luck, Bobbi! Such a tricky business this is. I love researching history and sometimes use it as a form of procrastination from my real writing. Revision and research are both so time consuming and like you say, all that work with no guarantees... somehow we persevere. Yes, Irene, it does take time! And it so helps to know that it's the same for other writers! Carmela: in Milan!! How interesting! And that would indeed make an already challenging process that much more difficult. Laurie and Rebecca, thank you for your kind words! And Yvonne, thank You! Thank you, everyone, for the reminder that I'm not alone! Yes, you've described the revision-angst well. I have a story that's been sitting and stewing for a while, and just now am I getting back into it. It took a keelboat trip, but that experience is what has driven me back to renewing the journey with this book. Thanks for the chins-up post. You can do it, Bobbi. Great post. It's so great to know we're all suffering together! And yet… I wouldn't leave the world of children's literature for anything. The support and richness of our field is beyond my wildest imaginings. Thanks for describing the process so vividly. I felt as if I were right next to you, handing you Kleenex! And still you kept going. And going. Inspiring. And the quote at the beginning is gold! Thank you, Carla and April! And here's an update: I finished the revision today! We can do it!